Terrine making has a long and illustrious history and their simplicity and ease to both eat and create has ensured its longevity as a popular dish. The first terrine (pâté) dates back to the Romans, but the recipe has evolved over the centuries. One of the things I love about terrines is that whilst they have a reputation of refinement and sophistication they are as at home on the menu of a top-class restaurant as they are in a picnic basket. Indeed I don’t think there is a dish as simple to prepare that gives comparable dining pleasure. Whether dressed up with aspic flourishes and pastry leaves or presented plainly as a simple rustic lunch with crusty bread there is a satisfying terrine for every occasion. Generally when we think of terrines we tend to think of terrines we think of the classic mixed game or rich pork creations, however, a vegetarian version can provide a satisfying change and can be just as hearty and tasty as any of meat terrine. This recipe for a meat free, dairy-free and gluten free terrine is certainly not taste free and tends to be a hit with vegans, vegetarians and hardened carnivores alike. It’s absolutely delicious served with a good dollop of crab apple jelly or even a cranberry and port jelly. I have served this dish as both a starter on its own and as a main dish with served with roast vegetables. Soak the dried porcini mushrooms in the red wine and water for 40 minutes. Meanwhile in a medium sized saucepan heat the oil and gently fry the shallots for 4-5minutes until just translucent , add the garlic and fresh Portobello mushrooms and on a low heat sauté for 5 minutes. Add the rehydrated porcini mushrooms with all the liquor and over a low to medium heat gently reduce, stirring regularly until the liquid has thickened to a glaze. Add the cayenne pepper, mustard and jelly and stir to combine. Stir in the coconut milk. Bring to the boil and simmer and stir for approximately 5 minutes or until the mixture is beginning to reduce. Remove from the heat and add the agar agar and whisk to combine. Place back on a low heat and whisk continuously for 5 minutes until fully dissolved and incorporated. Remove from heat and allow to cool for 10-15 minutes. Meanwhile blitz the skinned nuts in a food processor for 5 minutes or until it reaches the consistency of a smooth creamy butter. Stir the home made hazelnut butter into the mushroom mixture; combine well; then transfer to a lined terrine mould and chill in fridge for a minimum of 2 hours until fully set. I made this wonderfully hearty dish last year during a cookery theatre session at Blackpool Winter Gardens, where I performed next to a string of chefs including Sean Wilson (aka Martin Platt from, Coronation Street). The demo drew a good Lancashire crowd who lapped up this simple and rustic dish that is great for relaxed dining, simple suppers or sumptuous picnics. Line the prepared terrine dish with a layer of bacon and set aside a couple of rashers to cover the top of the terrine. Dice any remaining bacon and slice the pheasant breasts. Set aside. Put the belly pork in a food processor (or a mincer, if like me you prefer a coarser grind). Transfer the ground meat mixture to a bowl and add the garlic, juniper berries, herbs, a generous teaspoon of salt and lots of black pepper and the diced bacon then pour in the red wine. Mix it all up well with your hands. Cover with cling wrap and set aside for at least an hour to let the flavours develop. You can leave the meat to marinate over night, simply cover and place in the fridge and leave overnight for a really rich flavour. Set the oven to gas mark 2/150°C. While the oven heats up spoon a layer of ground meat mixture into the buttered terrine or tin, smooth the top and then follow with a layer of pheasant and diced game, continue to alternate the layers until the terrine is filled. Arrange the bacon rashers over to cover the meat. Stand the terrine dish/tin in a roasting tin, then pour in hot water to come halfway up the side of the terrine dish. Cook for 2½ hrs, until a skewer comes out cleanly when inserted, with clear juices and the terrine shrinking from the edge of the dish or tin. Take the roasting tin out of the oven and put the terrine dish on to a clean baking sheet. Leave to cool at room temperature for serving warm with crusty bread. Place in the fridge overnight if you wish to serve cold (as is traditional)I for this will make for ease of slicing. Top tip: To freeze: take the cooked terrine out of the dish/tin and wrap it well in cling film, then a good layer of kitchen foil, label and freeze. Use within 2 months. When you come to defrost, loosen the wrappings and thaw in the fridge. Nearly every charcuteric in France sells terrine de campagne. The mixture should not be finely minced, instead it should offer a coarse texture that you can really get your teeth into after all campagne means country so this should be in a country, rustic style. This recipe requires the art of packing the meat down into the terrine. In charcuterie terms, packing involves tightly cramming a terrine with ground spiced meat, spirits, eggs and cream and baking it in a water bath. The resulting baked loaf of spiced and fortified meat is weighted down and refrigerated for a day so that it compacts and develops its full flavour potential. In a mortar and pestle grind the salt and spices together and add to the shallots along with the chopped fresh parsley. Stir well to combine. Whisk in cream, eggs, and brandy until combined well. Pulse pork livers in a food processor until finely chopped, then add to onion mixture along with ground pork, diced bacon and veal and mix together well with your hands or a wooden spoon. Place the bay leaf at the bottom of a terrine Mould. 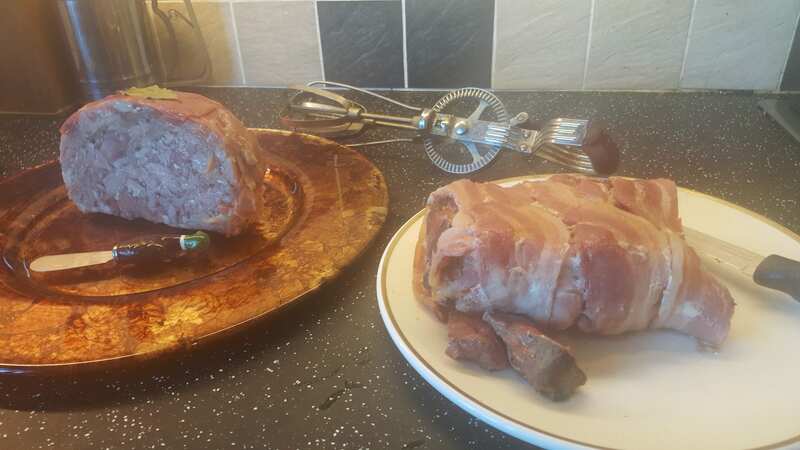 Then line the bottom and long sides of terrine mould crosswise with about 6 to 9 strips of bacon, arranging them close together (but not overlapping) and leaving a 1/2- to 2-inch overhang. Fill the terrine evenly with the coarse ground-meat mixture, rapping terrine on counter to compact it (it will mound slightly above edge). Cover the top of the terrine lengthwise with 2 or 3 more bacon slices if necessary to cover completely, and fold overhanging ends of bacon back over these. Cover the terrine with cling film and chill for at least 8 hours or overnight to marinate the meats. After a night of marinating your terrine is ready to bake. Discard the cling wrap and cover the terrine tightly with a double layer of foil. Bake the terrine in a water bath for to 2 hours. Check that a skewer when inserted into the centre comes out clean and if so remove from the oven if not cook further. Once cooked remove the foil and let the terrine stand in the mould on a rack for 30 minutes. Place a piece of parchment or wax paper over the top of the terrine, then place on top of the parchment a piece of wood or heavy cardboard wrapped in foil. Place 2 to 3 food cans on top of the wood or cardboard to weight down the cooked terrine. Chill the terrine in its tin/dish with the weights until completely cold, which will take at least 4 hours. Continue to chill the terrine, with or without the weights for at least at least 24 hours in order to allow the flavours to develop. 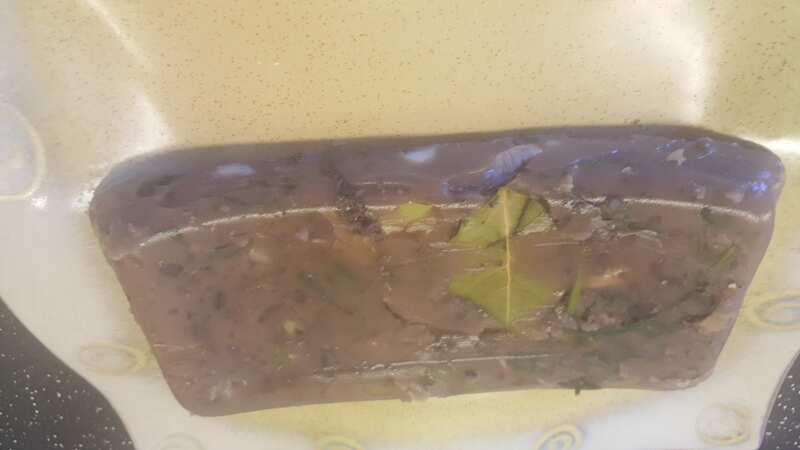 Run a knife around inside edge of the terrine and let it stand in the mould in a pan with 1 inch of hot water (to loosen bottom) for 2 minutes. Tip the terrine mould (holding terrine) to drain any excess liquid, then invert a cutting board over the terrine and re-invert the terrine onto the cutting board. Carefully wipe the outside of the terrine with a paper towel. Let the terrine stand at room temperature for 30 minutes before serving, then transfer to a platter if desired and cut, as needed. This Terrine keeps, wrapped in cling film and chilled for 2 weeks. Well all that remains to say is bon appétit. I really hope that this article has inspired you to tackle the humble art of creating terrines, once you’ve made one it’s certain it will become a firm family favourite.